It is the Club’s very sad duty to report the death of one of the BRDC’s oldest Members, Jim Russell, who passed away last Saturday night, 30 March. He had been undergoing a hip replacement operation following a fall at home and would have been 99 in two months’ time. Jim was a Life Member of the BRDC, having first been elected in 1954. 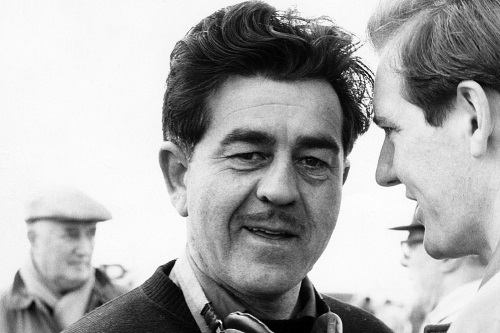 Although Jim was famous in more recent times for his eponymous Racing Drivers’ Schools, it was as a driver that he became very well known in the 1950s. As his service during World War 2 as a Flight Sergeant in the Royal Air Force came to an end, Jim began trading in cars, first in a small way but by the mid ‘50s his garage in Downham Market, Norfolk had expanded to become a Vauxhall main dealer. A visit to the local race track at Snetterton in 1952 whetted 32 year old Jim’s appetite for the sport and he lost no time acquiring a new Formula 3 Cooper-JAP Mk VI (T18). For the following year this first Cooper was replaced by a Mk VII (T28) fitted with a more potent Manx Norton engine and Jim was soon running at the front of the major Formula 3 races against the likes of Stirling Moss, Stuart Lewis-Evans, Ivor Bueb, Les Leston and Don Parker. By 1954 Jim could beat anyone including the great Stirling Moss in the Daily Telegraph Trophy at Brands Hatch, one of the major Formula 3 races of the year which Jim won three years in succession. In 1955, ’56 and ’57 Jim won the BRSCC National Formula 3 Championship. In 1956 he enjoyed a run of race wins which was unbroken until mid-August when future Grand Prix driver Stuart Lewis-Evans beat him at Oulton Park. In a busy 1957 season Jim only once finished lower than second when he was third at Mallory Park. Also in 1957 Jim had the chance to race a Formula 1 car for the first time when he drove the Gilby Engineering Maserati 250F to fifth place in the Formula 1 Glover Trophy at Goodwood. A few weeks later Jim had a more satisfactory outing in the car in a formule libre race at Snetterton when he finished a close second to the more powerful Lister-Jaguar sports-racing car of Archie Scott-Brown. By now Jim had become a factory driver for Cooper alongside Roy Salvadori although it wasn’t the happiest of arrangements since Jim considered that Roy was receiving preferential treatment. Regardless of any such bias against him, Jim was immediately a winner in the Manx-tailed Cooper-Climax T39 sports-racing cars from which evolved the single seater Coopers for the new 1500 cc Formula 2 introduced in 1957. It was not until 1959, however, that Jim left behind Formula 3, having won some 64 races in this hotly contested category between 1952 and 1958, and acquired a Formula 2 Cooper-Climax T45. Now 38 years old, Jim was immediately mixing it with Stirling Moss, Jack Brabham, Bruce McLaren, Harry Schell and other Grand Prix drivers of the day. Because of business pressures, Jim rarely raced outside the UK but in 1958 he visited the notorious banked AVUS track in Berlin where he beat Jack Brabham, a feat which he repeated at Montlhery, near Paris, a fortnight later. In total Jim won 11 Formula 2 races. At the start of 1959 Jim was at the peak of his form, winning the BRDC British Empire Trophy at Oulton Park in the F2 Cooper T45 and the sports car race in his Cooper Monaco in heavy rain on the same day before winning the F2 class of the Formula 1 BRDC Daily Express International Trophy at Silverstone at the beginning of May. A few weeks later disaster struck during the Le Mans 24 Hours when, as darkness descended, an unsighted Jim, unable to avoid a car which had spun and stopped across the road at the notorious White House corner, crashed very heavily. The Cooper caught fire and Jim sustained third degree burns to his arms, a broken leg, broken wrists and broken ribs. In the days before air ambulances, it was fortunate that Jim’s brother Peter was able to arrange for a private plane to fly to France and bring Jim back to Norwich where he began a lengthy recovery. The Le Mans crash was not quite the end of Jim’s racing. With the Racing Drivers’ School going well using Formula Junior cars, Jim was tempted back into the cockpit at the start of the 1961 season with a new Lotus Type 20. In his first race back, Jim finished third behind Trevor Taylor and Tony Maggs at his beloved Snetterton which he repeated at Aintree, this time behind the Team Lotus cars of Peter Arundell and Trevor Taylor. Then in the FJ race supporting the BRDC Daily Express International Trophy, a couple of weeks shy of his 41st birthday, Jim convincingly defeated all the young chargers in a classic Silverstone slipstreamer. Having proved his point, Jim retired from racing. The Jim Russell Racing Drivers’ School began at Snetterton in May 1957, a few weeks after the short-lived Cooper Racing School had opened for business at Brands Hatch. But it was the JRRDS which really established the template on which most other racing drivers’ schools came to be based. More than a few BRDC Members will have had their first experience of driving a racing car at a Jim Russell school, returning for further sessions according to how much they could afford. Over the following years other Jim Russell schools opened up at Magny Cours, where the Ecole de Pilotage Jim Russell started as a partnership with Bill Knight and his sons Mike and Richard before becoming the Winfield school, while there were others in Canada, the USA, Silverstone, Mallory Park and Donington Park. In 1966 Jim became heavily involved in John Frankenheimer’s famous film Grand Prix taking on the task of supplying 20 F1 lookalikes based on the School’s ageing Formula Junior chassis. The story goes that although the original script called for James Garner/Pete Aron to be ‘racing’ a Lotus at the beginning of the film, Colin Chapman would not release details of his new F1 car to Jim so that its appearance could be copied, despite Lotus having just received an order for 18 new school cars, so the cars became BRMs instead. When Formula Ford was devised by Motor Racing Stables at Brands Hatch in 1967, Jim was keen to be involved but rejected Colin Chapman’s demand that he place an order for 50 Lotus 51 chassis and turned to Alexis instead, the Russell-Alexis being the result. When a young Brazilian arrived in Europe in 1969 to pursue his ambition of becoming Formula 1 World Champion, he was pointed towards Jim who took Emerson Fittipaldi under his wing and guided him rapidly through Formula Ford into Formula 3 so that by the end of that first season he was the British F3 Champion. Emerson was the first of many young Brazilians who made their way to the JRRDS over the following years, a tradition which was maintained by Jim’s brother-in-law Ralph Firman who set up his Van Diemen company in 1973, having been Emerson’s mechanic four years earlier. To several generations of racing driver, the name of Jim Russell and the Jim Russell Racing Drivers’ School will never be forgotten. In his own way, Jim was, and will always be remembered as a legend. To his widow Jenny, their daughter Amanda and sons James and Robert, and their families, the BRDC extends its most sincere condolences. Jim's funeral will take place on Tuesday 23 April at 2pm at St Peter & St Paul's Church, Church Road, Bardwell, Bury St Edmunds, IP31 1AH.